Freeparking Review 2019: Is Freeparking a Good Hosting? Freeparking is a New Zealand company that offers website hosting solutions including VPS, VDS, e-commerce, and WordPress Hosting. It appears in the top five web hosting companies in New Zealand by market share. Freeparking is a website hosting provider based in New Zealand. The company, which has been operational for more than 18 years, also has a presence in the U.S., India, Australia, and the U.K.Freeparking is a website hosting provider based in New Zealand. The company, which has been operational for more than 18 years, also has a presence in the U.S., India, Australia, and the U.K. The starter hosting packages from Freeparking include 5GB web storage, 10GB web traffic, one hosted website, and ten MySQL databases. The premium hosting packages, on the other hand, include unlimited web storage, unlimited web traffic, five hosted websites, and unlimited MySQL databases. Freeparking has one data center located in Auckland, New Zealand and their user interface is easy to use, allowing users to get updates pretty quickly as well as easily make changes to settings like DNS. Users who love self managing will love this interface. One of the challenges you’re likely to face when using their hosting solutions is their email solution. This service is not as reliable; a considerable number of users have reported struggling to send emails for weeks. Incoming emails are also often rejected because the inbox is showing “Full” even when it has no emails. What’s more, their mail servers seem to have been blacklisted by Spamhaus. Freeparking has not made any considerable effort to deal with the incessant attacks to its systems that many customers have complained about. Freeparking hosting solutions are reasonably priced. However, they offer SSL certificates as an add-on that users have to pay for separately. For customers that want to run websites that require an SSL certificate, buying it separately makes this hosting solution pretty expensive. Freeparking hosting plans are listed in U.S. Dollars, but users are sent invoices quoted in their local currency. This can sometimes result in the vendor charging you more as they again convert the local currency on the invoice back to dollars. In addition, expect the prices to rise significantly after your first billing period expires. The low prices are introductory and only apply to your initial purchase term. Freeparking also offers their customers a free domain for life for as long as the user remains their hosting customer. However, this offer only applies to .nz and standard gTLD domain names. You can contact the Freeparking support team via email, their support phone numbers including a toll free one, or by submitting a ticket. They have a live chat option but it takes quite some browsing to find it on their website. Freeparking support services are not available 24/7. Email support is available weekdays from 8:30 a.m. to 7:30 p.m. and 8:30 a.m. to 5:30 p.m. New Zealand Daylight Time (NZDT) on weekends. Phone support is available weekdays from 8:30 a.m. to 5:30 p.m. and Saturdays from 10:00 a.m. to 2:00 p.m. (NZDT). The quality of Freeparking’s support leaves much to be desired. While the support team is polite and does their best to help, they are often ill-equipped to handle most of the hosting issues that customers present. You may prefer to take advantage of the fairly comprehensive knowledge base offered by Freeparking that includes an FAQ section and video tutorials. Freeparking seems to have the infrastructure necessary to host small and medium-sized business websites in New Zealand. However, their less than optimal support and challenges with their email hosting solutions may make them less preferable to other hosting vendors in New Zealand. Check out Freeparking’s web hosting options today! 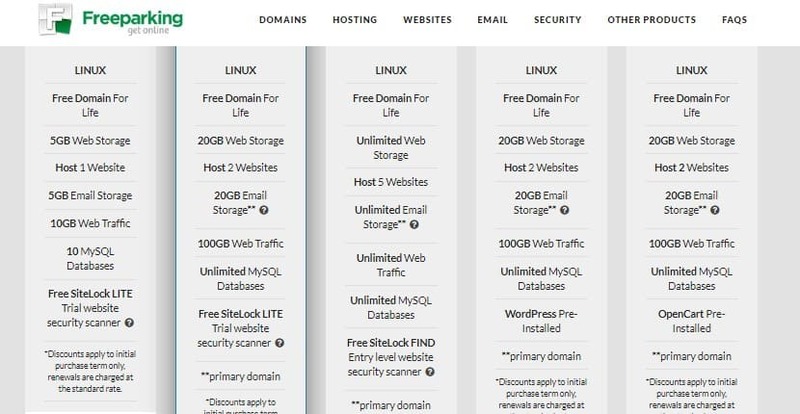 Wondering how Freeparking stacks up against other Web Hosting companies? Enter any other Web Hosting company and we will give you a side-by-side comparison.